Yield loss from rain-induced fruit cracking is a perpetual risk associated with the production of sweet cherries,and is difficult to manage due to the unpredictability of fruit responses to late season rainfall. The aim of this five-year study was to investigate the relationship between fruit crop load and incidence of cracking. The results showed a negative correlation between crop load and incidence of fruit cracking, and it was found in both natural and manipulated crop load trials for all varieties studied and in all seasons assessed. The effect of crop load on final cracking levels are determined post cell division. Results from this study showed that fruit width was positively correlated with cuticular cracking but, contrary to what has been purported in literature, no relationship between concentration of soluble sugars or firmness with the incidence of cracking was found. 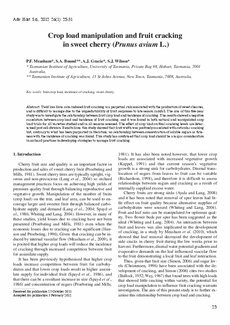 This study has confirmed that crop load should be a major consideration in orchard practices in developing strategies to manage fruit cracking.